To enroll, visit Firefly between Oct. 29 and Nov. 16 and select "Benfits Enrollment" on the Employee Self Service page. Employees can review their current benefits plans at any time by clicking "Benefits Participation" on the Employee Self Service page. 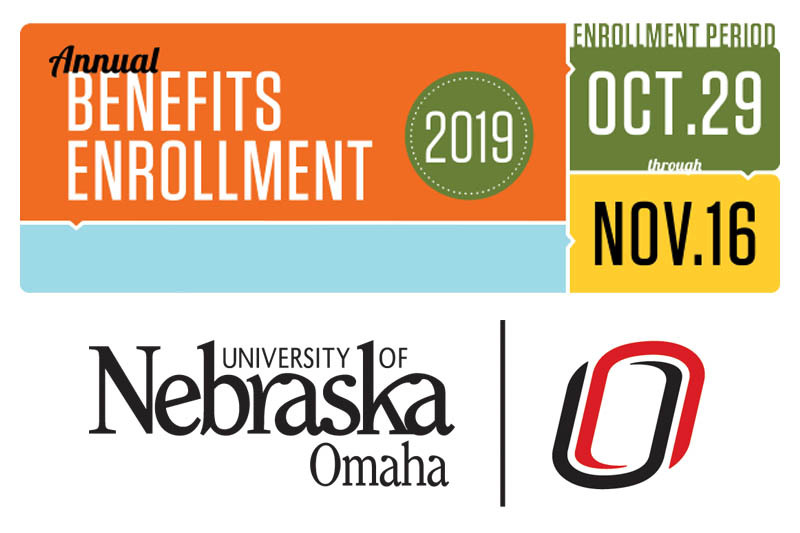 Those looking for individual help are encouraged to attend one of the NUFlex enrollment informational meetings hosted by UNO Human Resources on Tuesday, Oct. 30, or Monday, Nov. 5. Open computer lab times, on Tuesday, Nov. 6, and Monday, Nov. 12, are also being provided to help people get enrolled. Questions? Contact Human Resources at 402.554.3998 or unohr@unomaha.edu. In 2019, the University of Nebraska will be making a number of enhancements to the university's health plan that will lower costs, expand services and better meet the health care needs of employees at UNO and the other campuses across the NU system. A summary of the changes were also shared in an online open house on Wednesday, Oct. 17, which was recorded and can be accessed online. The addition of a high-deductible health plan option that will allow members to take advantage of a personal health savings account. This option will be in addition to, not a replacement for, our current high, basic and low options. The Health Risk Assessment (HRA) will once again be offered online this fall as part of the annual NUFlex enrollment. All active, benefits-elligible employees and retirees have the opportunity to complete the HRA, beginning Monday, Oct. 29, through Friday, Nov. 16, at 5 p.m. CST, via Firefly. Participation is voluntary; however, by completing this survey, employees will receive a personal health report that will help them assess and monitor thier personal health status. Those participating in the Wellness Blood Screenings on Thursday, Nov. 1, are encouraged to keep their results for use in the HRA. There will also be a Health and Wellness Fair that same day to help answer general wellness questions you may have. Employees who are enrolled in the University’s medical plan and complete the HRA will also be eligible for enhanced wellness and preventive service benefits for themselves as well as their covered family members. The HRA survey must be completed each year in order to receive the enhanced wellness and preventitive services benefits for the following calendar year. Employees will receive a confirmation email following the successful completion of the HRA survey. The confirmation will be sent to the email address provided when completing the survey. Human Resources still recommends you print or save the HRA report, but the email will be the proof that the assessment was completed. The new plan will include coverage for fertility treatments - a change many faculty and staff have sought for some time - with a $15,000 limit. I have specific questions about items currently covered under my plan and how this change might affect them; who can I speak with? - Two open computer lab sessions for registration will be offered Tuesday, Nov. 6, from 10 a.m. to noon at KH 543, and Monday, Nov. 12, from 1 to 3 p.m. at DSC 114. I have a provider that is not currently on United Healthcare or Ameritas, but is willing to work with them to be an in-network provider. How do I make that happen? In order to start the process, please work with your campus benefits manager. I am a new employee who started/is starting before the next enrollment period (Oct. 29 – Nov. 16), does that mean I have to enroll twice? Yes; however this would have been the case even if the University was not changing its providers as employees have the opportunity to adjust their benefits plans each year during annual enrollment. The only difference will be that your 2018 medical and dental benefits will be managed by Blue Cross Blue Shield and your benefits for 2019 and beyond will be managed through United Healthcare for medical and Ameritas for dental. Will I continue to receive letters, emails, or other notices from Blue Cross Blue Shield even after Dec. 31, 2018? Insurance claims for any medical procedure with a service date prior to Jan. 1, 2019 will be handled by Blue Cross Blue Shield, which would mean all usual notices that you would receive for those procedures would be coming from Blue Cross Blue Shield. Beginning Jan. 1, 2019, insurance claims for procedures will come from United Healthcare or Ameritas. Are my pharmacy benefits changing? The University of Nebraska will continue to work with CVS/Caremark to manage prescription needs. There are no changes impacting prescription benefits. Are my eye care benefits changing? The University of Nebraska will continue to work with EyeMed for vision-related procedures and prescriptions. Do these changes impact my WageWorks Healthcare Flexible Spending account? No, WageWorks is an entirely separate process that helps provide reimbursement for healthcare costs, regardless of the insurance provider. Will any of the benefits covered under my previous plan go away due to this decision? Because the University of Nebraska is self-insured, the change in insurance providers will not impact the types of services covered. In fact, a review of the University’s previous plan has allowed for benefits to be added that previously didn’t exist. Will my monthly premiums change because of the change in providers? On Sept. 18, 2018, NU President Hank Bounds reported the coverage options and premiums that will be in place as part of the University’s benefits plan, which United Healthcare and Ameritas are managing on behalf of the University. These included the announcement of a 2 percent reduction in medical premiums for 2019. As part of the updates to the University's healthcare plan, several new options were introduced, including coverage for fertility treatments and the addition of coverage for tubal ligations and vasectomies. At UNO, you can contact Esther Scarpello, the campus fringe benefits manager, at 402.554.3660 or escarpello@unomaha.edu. There are also several informational sessions and open computer lab times being held during the enrollment period.